injects its hereditary material into a cell and immediately destroys the cell. injects its hereditary material with the active virus. injects its hereditary material into the host cell and becomes part of the cell's existing hereditary material without destroying the cell or making new viruses. injects its hereditary material into the host cell and remains without harming, changing, or destroying the cell. There are two types of viruses: active viruses and hidden viruses. An active virus reproduces and destroys the cell it attacks. Which describes a hidden virus? The virus's genetic material takes over the functions of the attacked cell immediately. The virus attaches to the surface of a bacterium, injects genetic material, takes over cells functions, produces proteins, and destroys the cell. The genetic material of the virus is injected into the cell's genetic material and becomes a part of the cell's DNA until triggered to reproduce. The virus survives only in water. What can only live inside other cells? Where are copies of a virus made? HIV is the virus that causes the disease AIDS. It is a special kind of virus because it replicates itself in a backward fashion compared to other viruses. What kind of virus is HIV because of this behavior? 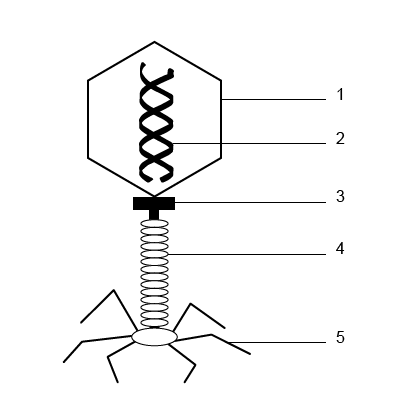 Which structure of the virus contains the genetic material? What information does the text give about a virus that it does not give about a worm? Hidden viruses enter a cell and immediately begin to multiply. Which structure of the virus is used to attach to the bacterial membrane?